The first SMS was sent on December 3 1992 – it read “Merry Christmas”. It was a test message sent from a computer, the first commercial service would open for business the following year. SMS quickly become the glue that holds the world together. Trillions of messages are sent every year and they range from quick words between friends through bank notifications of money transfers to paying for parking. The system is pretty limited – it supports messages up to 160 characters. And those characters are mostly limited to the Latin alphabet plus some diacritics. Other alphabets are supported, but the maximum character count drops to just 70. 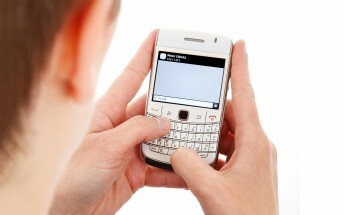 Concatenated SMS was developed to alleviate the issue. How it worked was simple – split a long message into multiple standard length texts and add just enough metadata so that the receiving phone can reassemble the original long message. Of course, each sub-message was charged at full price and compatibility was spotty in the early days. SMS, due to both message length limits and speed of typing, has lead to the rise of its own writing system – txtspk. It has become so pervasive that it’s sneaking into regular speech too. The next evolution was EMS – Enhanced Messaging Service. It added support for text formatting (e.g. bold or italic text, different font sizes), but more importantly allowed phones to send binary data. This meant ringtones, icons and even simple animations can be delivered to a phone over the air. The icons (simple black and white images) could be mixed in with the text, making this an early form of emoji. EMS was built on top of SMS, so it was still transferred in 140-byte chunks (SMS uses a 7-bit alphabet, 140 bytes / 7 bits = 160 characters). For example, a 32 x 32px image took 128 bytes to encode, almost a full SMS message. There were ambitious plans to extend EMS to support color images, compression and more, but that didn’t go far. EMS was replaced by MMS, which was supported by the rise of camera phones. An MMS message could contain a photo, an audio recording or even a slideshow of several multimedia files. File size limits were in the hundreds of kilobytes (they varied by carrier), so much more generous than EMS. Plus, mobile cameras had a resolution of only a few megapixels. BlackBerrys and i-mode phones took a different approach – they just used email. This saved them the trouble of reinventing the wheel as email already supported text formatting and attaching files (multimedia or other). And since we mentioned emoji, early SMS texters were using emoticons - :-) and the like. 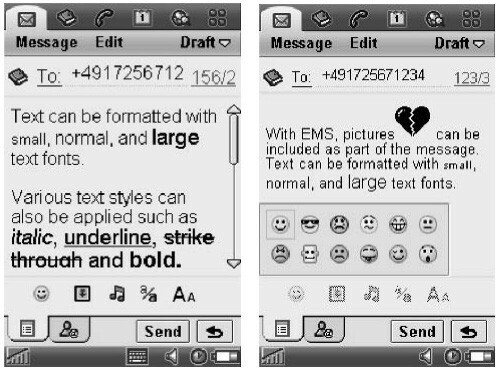 Emoji first appeared on Japanese phones in 1999 and the symbols were created by UI designer and inventor Shigetaka Kurita. Since then the Unicode Consortium has taken on the responsibility of defining new emoji, but standardization is still an issue. Issues range from inane (the poorly made hamburger) to ones that cause actual miscommunication. Look at “grimacing face” for example. It’s meant to convey awkwardness or nervousness, but early versions of Android turned it to anger. We’re not even going to try and guess what the Samsung version is supposed to be. The next stage in evolution is RCS – Rich Communication Services. In short, it aims to be Android’s iMessage. But there's quite a lot about that and we’ll need to do a separate article about that.